Summary: Sixteen-year-old Starr lives in two worlds: the poor neighbourhood where she was born and raised and her posh high school in the suburbs. The uneasy balance between them is shattered when Starr is the only witness to the fatal shooting of her unarmed best friend, Khalil, by a police officer. Now what Starr says could destroy her community. It could also get her killed. Simply put, this is one of the most powerful and thought provoking insight in to the way other people live i’ve ever had the pleasure of reading. I was in a little bit of a YA slump until i read The Hate U Give. It completely blew up in America and was fueled by the movie rights being bought. I went in to it thinking it was over-hyped, but it’s simply phenomenal. 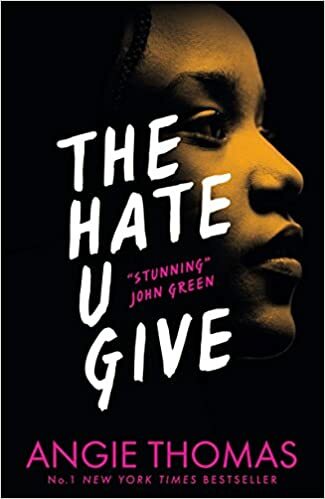 Angie Thomas was inspired by the Black Lives Matter movement to write this wonderful book about police brutality and the difference in cultures. It’s something i’ve never come across or read about before, and to be completely honest i was quite ignorant to what is going on in the world in these types of places. It opened my eyes a lot. The police here don’t even carry guns. What happens if they tell you to put your hands up? You just listen? That really hit home about how different the two countries. This novel highlights the way suburbs of the U.S. live and how difficult it can be for black people just to stay alive with law enforcement around. It also highlights code switching, white privileged and so much more that’s incredibly important to know. Thomas managed to incorporate a lot of important topics in to a wonderfully written story about speaking up and the importance of making your voice heard: how it is the most powerful thing a person can have. I learnt a lot while reading this about how important it is to have your voice listened to, and i didn’t connect with the characters situations in any way. Even though i didn’t connect with situation of any of the characters, i understood what they were going through and was shocked by the amount of empathy i felt towards them. It’s a truly emotive book without actually being written in an emotive way. I have no idea how Thomas wrote in that way. The character’s were quite relatable in their own ways, and the images that the novel gave off were very vivid and real. That’s always helpful when you’re trying to understand a situation you previously have no idea of. I cannot praise this story enough. The writing is perfect, the characters and wonderfully rounded and the story-line is full of culture appreciation and follows the Black Lives Matter movement wonderfully. It has some very strong messages and some lessons to teach everyone about standing up for yourself and who matters to you and being heard. Everyone should read this book. It’s stunning.